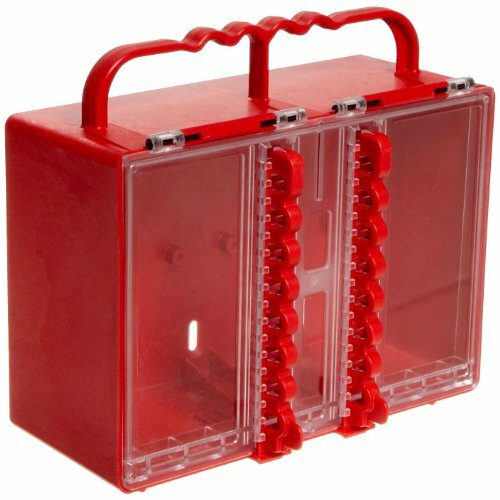 Brady 50937 Portable Plastic Lock Box. Material type is isoplast box with clear polycarbonate windows. Size is 7-1/2" height, 8-1/2" width, 4-1/4" depth. Color is red. Lock boxes require fewer locks and are lighter than hasps on delicate energy isolating devices like circuit breakers. Excellent chemical and heat resistance properties and impossible to corrode. Patented lock rails hold up to 16 padlocks (locks not included). Slot in front allows keys to be inserted when box is locked and transparent polycarbonate windows let you view contents from the outside. Pre-drilled holes in back allow for easy wall-mounting. Comes with 12 hooks for hanging keys, locks, etc. Inside box. Extra key hooks (50939) are available in packs of 12.